Accord CD Ripper is an allround and powerful audio CD extracting software. Accord CD Accord CD Ripper Xtreme is a ripper can rip audio CD tracks to WAV, MP3, WMA, OGG, APE, FLAC, MP2, VQF, AIFF, AIFC, AIF, 3GP, AAC, M4A, M4B, MP4, MPC, MP+, MPP, WV, AU, SND, RAW, GSM, VOX, PCM, ADPCM, G721, G723, FAP, PAF, SVX, 8SVX, IFF, NIST, IRCAM, SF, VOC, W64, MAT, MAT4, MAT5, PVF, XI, HTK, CAF, SDS, AVR, WAVEX, SD2 and user-customized formats etc. *Incredibly fast cd ripping and allow you to rip multiple CDs simultaneously. *Fully optimized for SSE/Hyper thread technology and get extra speed boost on multiprocessor systems. *Allow the users to encode audio CDs to customized formats thru their own encoders. *Flexible output mode: rip audio CDs to divided files (one file per track) or to CD images (one file per disc with cuesheet or chapters). *Not only rip tracks, Accord CD Ripper is capable of ripping arbitrary sector range of an audio CD. *Normalize audio volume to a given percentage. *De-emphasis the rare Pre-emphasis CDs. *Secure CD ripping. Four build-in advanced disc error correction strategies: BURST, SYNC, SECURE and PARANOID. Three choices of actions on reading or synching an error during ripping: STOP and SILENCE. *Retrieve album info from remote and local CDDB (Compact Disc Database) servers. Qweas is providing links to Accord CD Ripper Xtreme 6.8.3 as a courtesy, and makes no representations regarding Accord CD Ripper Xtreme or any other applications or any information related thereto. 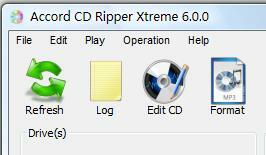 Any questions, complaints or claims regarding this application Accord CD Ripper Xtreme 6.8.3 must be directed to the appropriate software vendor. You may click the publisher link of Accord CD Ripper Xtreme on the top of this page to get more details about the vendor.